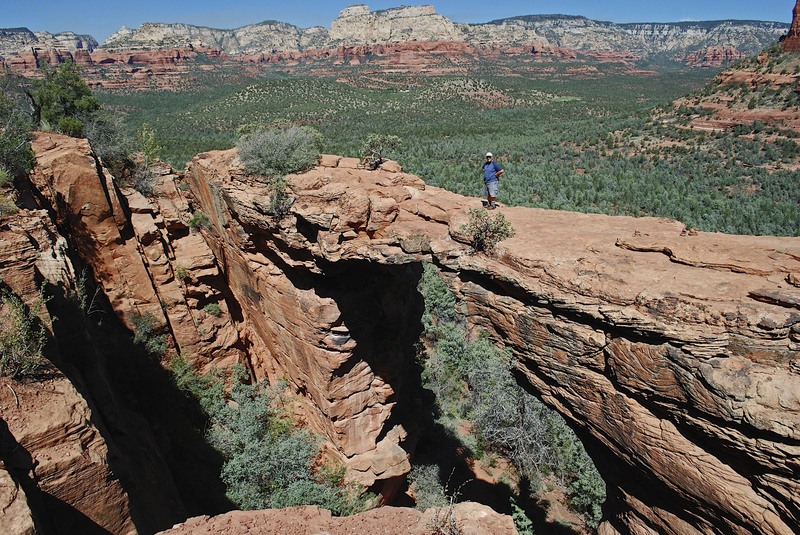 Sedona, Arizona…. if you make it! Quite a few years ago, on our first approach to Sedona, my family was “concerned” when I silently decided to take our rental car on a long winding dirt road of questionable condition off exit 320, I-17, instead of Rt. 179, the usual approach from the south. The allure of adventure compelled me. Schnebly Hill Road, winds for about 13 miles from I-17, the North-South Interstate highway in Arizona. 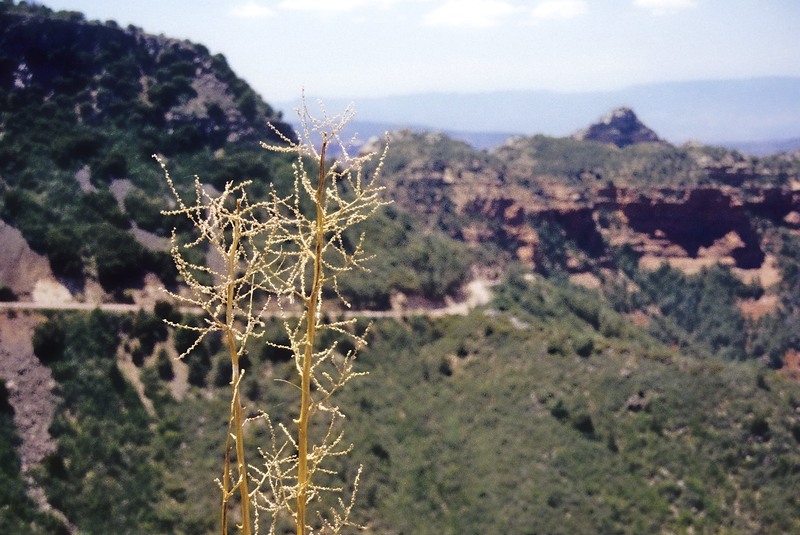 It courses through mostly flat, but impressive ponderosa pine forests, until its last few dramatic miles of descent, some 2000’ (~600m,) where the vegetation “transitions” into pinyon and juniper trees; and the sudden awesome vistas of eroded sandstone formations and outcroppings come into view. These sheer cliffs, monoliths, and curious cathedrals of all shapes, blazing with white, and red and orange colors, are like sculptured inverted children’s pails and castle turrets in a sandbox. Upon first sight, the usual reaction is to gasp, but attention needs to be paid to the deteriorating, eroded, winding, road as it descends rapidly at it’s most perilous point. What lies at the end of Schnebly Hill Road? The treasure of the Red Rocks Country. But if you dare take this route, advise the family ahead of time, and rent a 4WD SUV! The descent, as the dirt road turns….challenging. 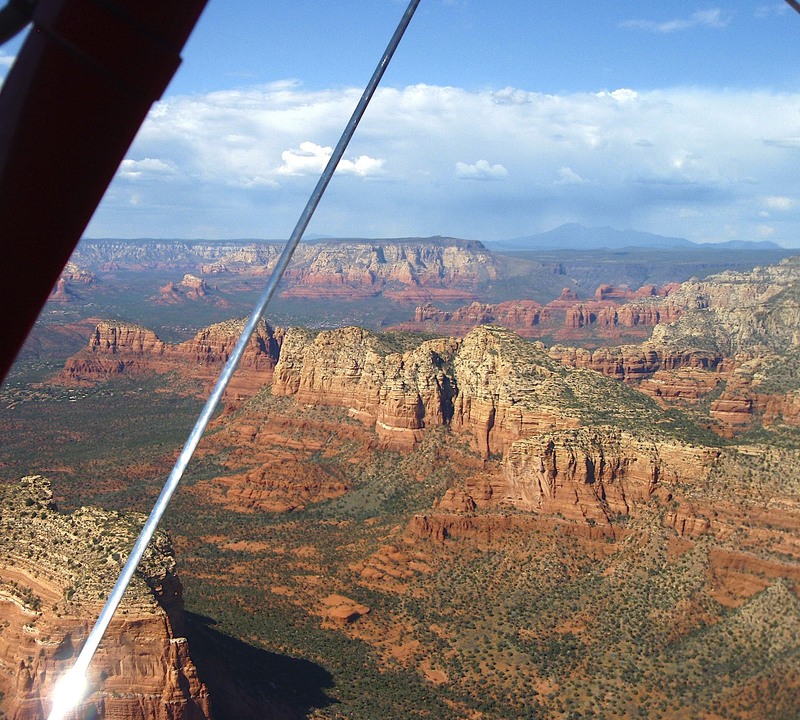 Some years later, from a classic Bi-Plane over Sedona. The edge of the Mogollan Rim is seen on the near horizon, and to its right, 12,633 ft. (3258m) Mt. Humphreys, about 45 miles North. 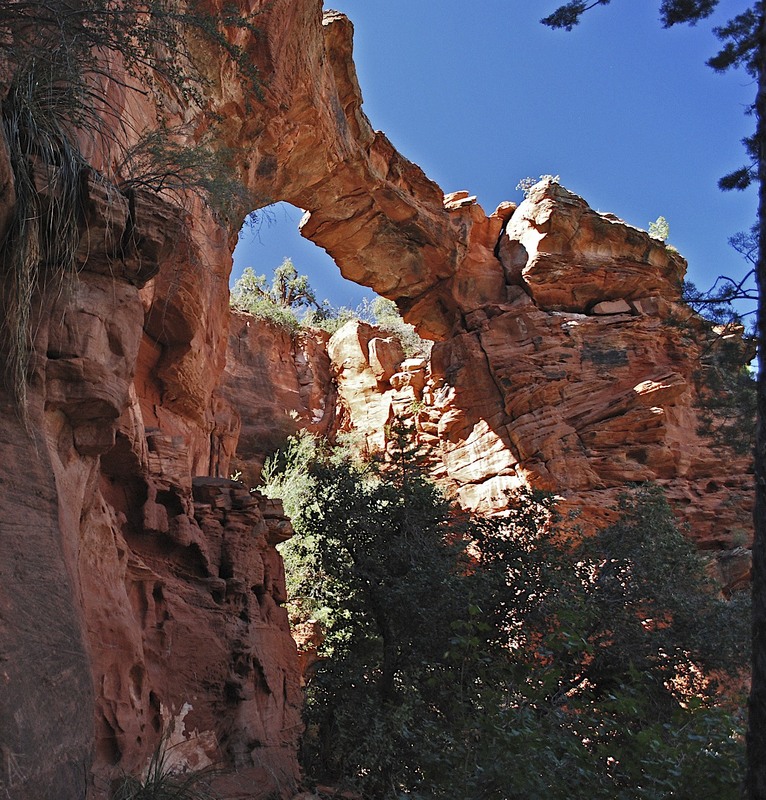 Devil’s Bridge is a moderate hike on the western side of Sedona. 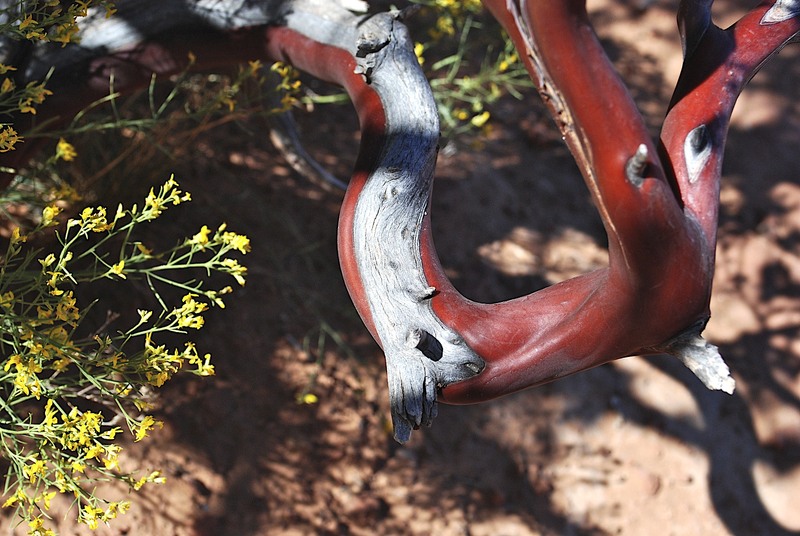 Along the trail, are wonderful examples of South-West US vegetation, this being a moderate sized Pointleaf Manzanita, known for its shinny red bark. Bargain, Orbs and Lead. Do you remember? 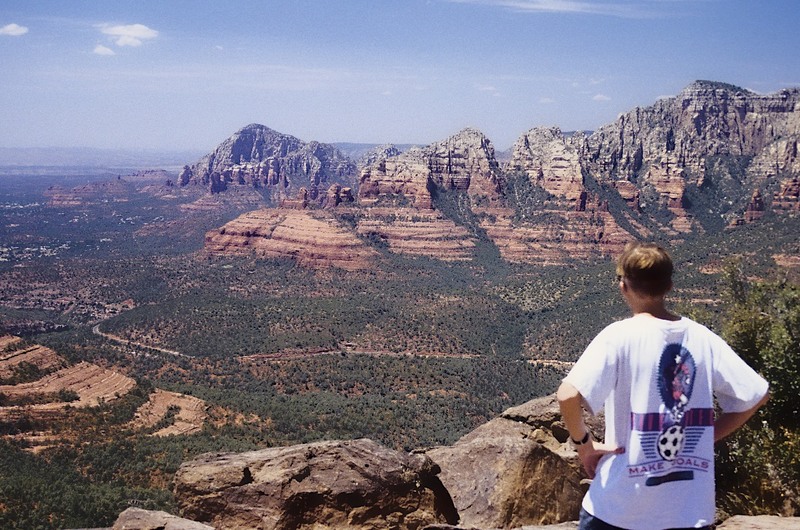 Stopped in Sedona about 6 years back during a road trip – beautiful there and hope to return for a more lengthy visit someday. Spectacular photos, make me want to get on the next plane and head over the sea! Amazing photos. I love the Devil’s Bridge photo very much.